The weather over the course of the next 7 days could probably be summed in with the the famous Glenn Fry song, “The Heat is On”, made famous by the “Beverly Hills Cop” movie starring Eddie Murphy. This push of much warmer air that began in many locations yesterday comes after a few days of very chilly weather that even brought some patchy frost to western North Dakota on Monday morning. 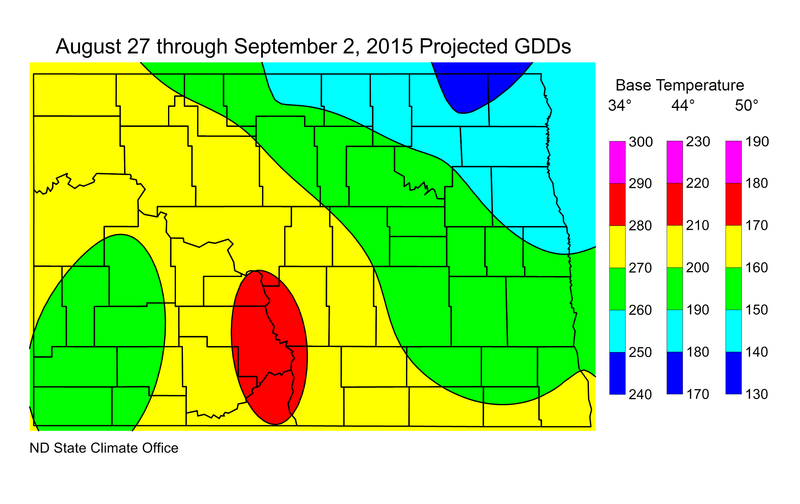 The transition to the cooler weather that occurred over this past weekend did bring with it the first measurable rainfall to some North Dakota Agricultural Weather Network (NDAWN) stations of the month, although, in some locations far too much of a good thing fell with over 7 inches recorded just east of Grafton. There will be a slight risk of a thunderstorm today (Thursday), otherwise, besides an isolated thunderstorm that is always possible during any given day of the summer, no widespread rain is expected until the first half of next week. 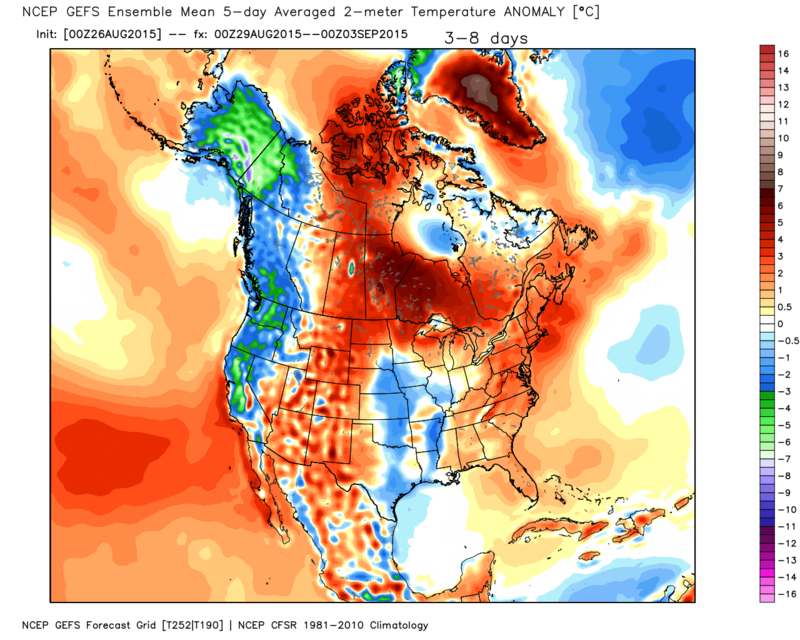 Temperatures are expected to average 3° to 5° Celsius (5° to 8° F) above average over this forecast period (Figure 1). In places without moisture stress concerns this will clearly give a late season boost to area crops as the growing season slowly winds down. One possible limitation to the upcoming heat will be the possible impacts of the smoke streaming across the region from the forest fires in the northern Rocky Mountains that will probably be impacting the area for the next several days. The smoke on some occasions this summer has lowered temperatures by as much as 5° to 10°, yet most days with a smoky sky, it has been closer to just a couple of degrees. With that one caveat, maximum temperatures should be in the 80s most of the next seven days with today (Thursday) being one exception for some locations in the Red River Valley. 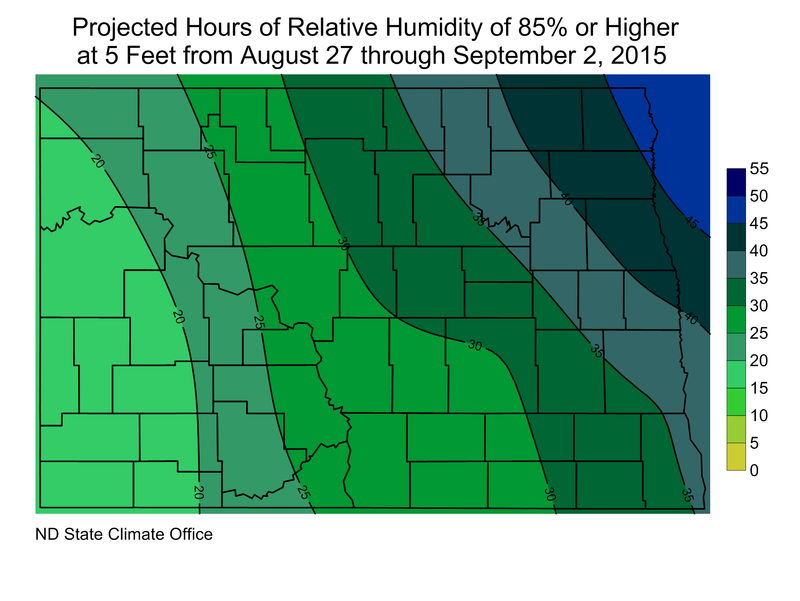 Central and western North Dakota in particular will have a few days with 90° plus potential during this stretch. Beyond the next 7 days, current projections are for a brief period of cooler air near Labor Day weekend, but overall, the first one-half of September seems to be on track to record above average temperatures overall. In the final Crop and Pest Report to be released on September 10, I will give my personal thought on probable weather conditions for this autumn into early winter. The projected Growing Degree Days (GDDs), base 50°, 44° and 34° for the period August 27 through September 2, 2015 are presented in Figure 2 and the number of hours when the relative humidity is expected to be at or above 85% can be found in Figure 3.